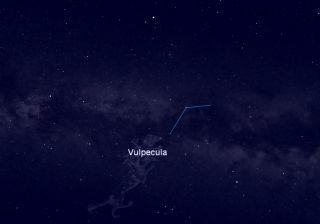 This night sky map shows the location of the constellation Vulpecula, the Little Fox, home to Brocchi's Cluster, a star cluster visible in binoculars and small telescopes. The constellation is visible in the east-southeast night sky between stars Vega and Altair. During the Perseid meteor shower this month I did some reminiscing on how, as a teenager, I used to watch this famous meteor display from my Aunt Irma and Uncle Ron’s house in then-rural Mahopac, New York, about 50 miles north of New York City. In the early 1970s the northern suburbs of New York were amazingly dark — much darker then compared to now – and whenever I visited my Aunt and Uncle I always made sure to bring my binoculars or telescope with me, because their night skies provided a treasure-trove of celestial sights that I could never hope to see from my light-polluted home base in The Bronx. And on one of those memorable midsummer nights, some 40 years ago, I stumbled across one of the most pleasing night sky sights for those using binoculars. It can be found this week nearly overhead in our late evening sky. With a bright moon currently out of the way, now is a good time to seek it out. Most amateur astronomers have heard of such beautiful open star clusters as the Pleiades, Hyades and the Beehive. But have you ever heard of the Coat Hanger? During the 1920s, Dalmiro F. Brocchi, then a well-known chart maker for the American Association of Variable Star Observers, designed a star chart depicting the region of the sky around Vulpecula, revealing this cluster. For reasons that I have never been able to fathom, Brocchi’s Cluster is rarely mentioned in most popular astronomy books. Yet, it is the brightest of all the star clusters in this part of the sky! In Swedish astronomer Per Collinder’s star catalogue, which was drawn up in 1931, it is cluster No. 399, hence its “official designation as Collinder 399. Those who have seen it have described it as a rather curious grouping of about a dozen tiny stars looking very much like an inverted coat hanger. In a clear, dark sky you might even perceive it with the naked eye as a fuzzy patch of light imbedded within the summer star clouds of the Milky Way. This is one object that is best suited for binoculars; even a small telescope will provide too much magnification and will cause the stars to appear too widely spaced apart. Cosmic ladle or celestial seesaw? Forty years ago while sweeping up and down the Milky Way with 7 x 35 binoculars, this delightful little cluster first hit my eyes. But actually, because the coat hanger figure appears upside down and a bit on a tilt, my original impression of it of it resembled some sort of a ladle (and since I was visiting my Aunt Irma when I made the discovery, I unofficially christened it "Irma’s Ladle"). Interestingly, what we are seeing in this pattern of stars is an illusion of perspective. This is not a true cluster at all, but rather just a chance alignment of stars that are placed at very different distances from our earthly vantage point. However … Collinder 399 is really a proper coat hanger only for Southern Hemisphere observers, where it appears right side up. It is for this reason, that not everyone sees Collinder 399 as a coat hanger. In fact, I once heard of one gentleman out in California who independently discovered it and later inquired as to "Why is this fulcrum never shown on star charts? It is a beautiful sight." And indeed, now that I’ve mentioned this allusion, it may cause many to see this cluster not as a coat hanger, but as a seesaw!